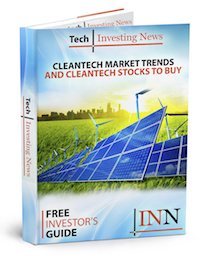 Which cleantech stocks have performed the best so far this year? Here’s a look at the top-performing cleantech stocks on the TSX and TSXV year-to-date. The Canadian cleantech sector was in the spotlight in the first quarter of 2019 thanks to opposing stances of Canadian political parties. During the quarter, the Canadian government put more focus on the industry in its 2019 budget while the Ontario government upped its ante against the federal government on the carbon tax issue. Despite varying opinions on cleantech policies, several companies on the Toronto Stock Exchange (TSX) and TSX Venture Exchange (TSXV) made their mark during the quarter. The Investing News Network takes a look back at the first quarter and which companies were the biggest gainers on the TSX and TSXV. The companies listed below all have market caps between C$50 million and C$500 million. All numbers and figures listed below are in Canadian dollars and were current as of market close on April 8, 2019. The list was generated using CapitalCube’s stock screener. With a gain of over 100 percent, Xebec Adsorption is the top stock in the cleantech space on the TSX and TSXV. The company is focused on developing products that help transform raw gases into sources of clean and renewable energy. Xebec operates in sectors that include industrial compressed air and gas treatment, clean technology and oil and gas processing. Xebec kicked off the year by announcing its first project in Italy, a biogas upgrading plant that became operational in January. The plant converts the biogas produced from local organic waste and turns it into biomethane, a compound also known as renewable natural gas. In March, the company announced the signing of a $6 million contract for another biogas upgrading plant in Italy. DynaCERT is a company that manufactures carbon emission reduction technologies for internal combustion engines. Its patent pending technology feeds in hydrogen and oxygen to an engine’s air intake, which enhances combustion and fuel efficiency while reducing carbon emissions. DynaCERT was fairly active throughout the quarter. It kicked off the year by announcing orders from two states in India. In late March, the company commenced the carbon credit application process for its HydraGEN technology. Apart from the potential increase in mileage in diesel engines, it can also eliminate carbon emissions, which increases its appeal in the marketplace. Questor Technology is a company that is engaged in clean air technologies that aim to improve air quality cost effectively. In January, the company announced that it received a purchase order worth $5.8 million for its technology, which will be used at three oil and gas production facilities in Mexico. Atlantic Power operates power projects in industries including gas, hydro and biomass with its assets in nine US states and two Canadian provinces. Major news from the company came in February, when it reported its fourth quarter and year end results for 2018. In the release, Atlantic Power provided updates on its projects, saying that four of them have power purchase agreements that will expire in 2019 and 2020. Carmanah Technologies’ products are focused on energy optimized LED solutions. Carmanah’s business falls into three segments, namely signals, illumination and offshore. Major news for the company this past quarter includes its asset sale to SPX (NYSE:SPXC) for US$77 million. The company said that the bulk of its assets were sold to SPX, but its management hasn’t revealed plans for the use of proceeds from the transaction. Editorial Disclosure: DynaCERT is a client of the Investing News Network. This article is not paid-for content.